The Adopt A Highway volunteers. 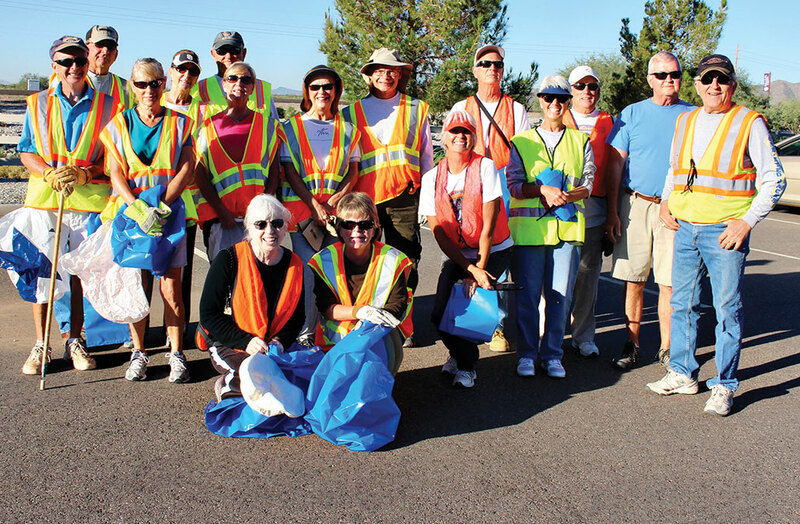 The kickoff for the Adopt A Highway season occurred on October 23 with 16 great volunteers doing cleanup on Jimmie Kerr Blvd. They collected 26 bags of trash and 10 pounds of aluminum cans. Marv Enerson takes the cans to the recycling center with proceeds going to the Flag Committee within the Support Our Troops organization. For more information on the recycling center, contact Marv at roadrunnr@me.com. A big thank you goes out to the following Robson Ranch residents: Scott Kincaid, Phyllis Flail, Isabelle and Gary Ocheltree, Barbara Gayer, Pat Carlberg, Nancy Stogsdill, Jan Stocek, Gerard Wittman, John Gluch, Linda and Ed Kovac, Mary and Bob Burton, Patty Bruchez and Marv Enerson. Our Robson Ranch Patrol member, Ike Borgen, assisted with transportation, water and supplies.